The Essie Encrusted Treasures collection got a ton of very mixed reviews. The chunky glitters in the collection were definitely a departure from Essie's usual fare, so I knew I would have to check out at least one or two of them. 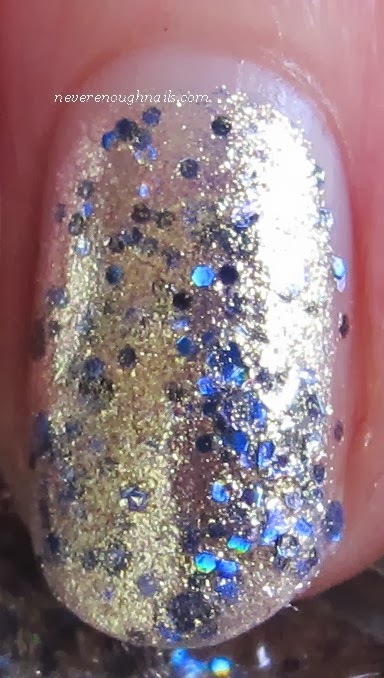 Essie On a Silver Platter is a silvery gold small particle foil base with purply-blue holo glitter. I actually really like this polish. I love the foil base color, it's gold, but it's not gold. It's a little silver, but oh wait, actually it's gold... it's one of those very distracting colors to look at on your nails! The violet holo glitter is really beautiful too, a lovely shade of glitter and has a nice rainbow flash. Now, some people might not like the chunky appearance of this polish. With top coat, it didn't feel super chunky, but it definitely still looks rather textured. This is three thin coats of On a Silver Platter. It covered better than I was expecting actually. I think with a very thin coat, you could use this as a topper for another color, but it works all alone too. The formula was pretty good, I had no trouble coaxing all that glitter out. So what's your verdict on the Encrusted Treasures? Super pretty or just too crusty for you? I really like this one and I may go back for a few more. I have a serious fascination with Belugaria, the funky chunky black hot mess. You might see it here eventually LOL. yah, this would be a great polish for those times when i'm in the mood for some texture! LOVE it. Me too Lissa! I want to try it over a dark purple-y blue too!